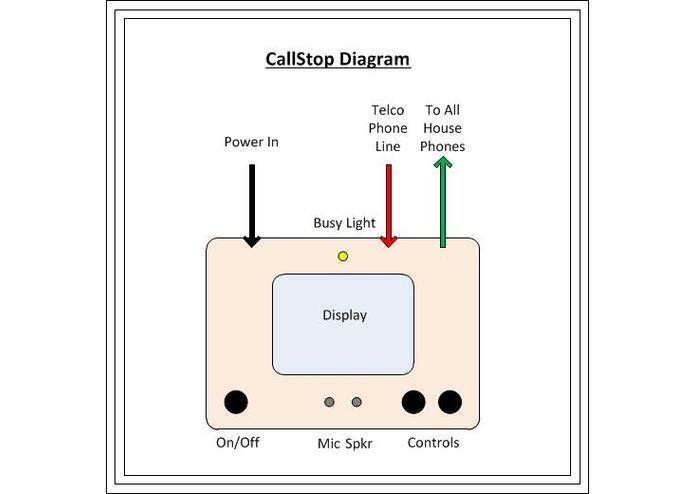 Callstop is an answering machine type device in the home that would intercept all calls. It would be placed between the incoming phone line and all phones in the house. Callers would hear a message similar to “Your call is being intercepted by CallStop. Please leave a message at the beep, or enter the password within [X] seconds to ring my phone. Today’s password is my address, digits backward. [Beep! ]” Or the password could be today’s date in ddmmyy format, and so on. It could be changed by the user as necessary. If the password is not entered promptly, the call goes to voicemail and no phones in the house are rung by the device. If the password is correctly entered, the household phones will ring as usual and the call will be put through. As with an answering machine, after X number of rings, the call goes to voicemail.